Task: Automate two critical processes – (1) cutting high precision dies used in extrusion presses and (2) loading hot aluminium billets into press machines – at a leading aerospace supplier that specialises in producing hard alloy aluminium parts for a wide range of aircraft. 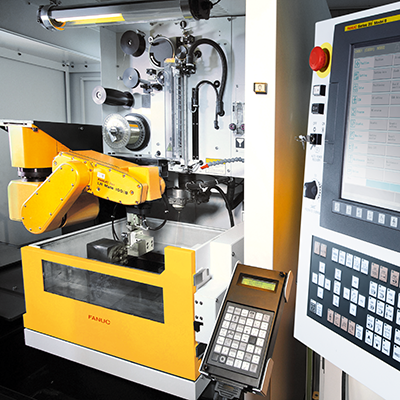 Solution: (1) Install a FANUC ROBOCUT wire-cut machine to cut the dies, ensuring excellent surface quality and shape. In some cases, these dies need to endure high temperatures and pressures of up to 16,200 tons in the extrusion presses. (2) Replace a conveyor with a robot to load 20 to 120 kg aluminium billets into extrusion presses. Result: (1) Since being installed in 2012, the ROBOCUT has run 24/7 producing some 9-10 dies a day. Precise to 0.001 mm, it has proved ideally suited to high precision die cutting. (2) Solving scratching and dead time problems caused by the conveyor, loading a single extrusion press with a robot proved so successful that robots were soon integrated into every press. In the 21st century one of the most popularly used materials is aluminium, offering versatile application opportunities for a number of industries ranging from the automotive to the construction industry. The Universal Alloy Corporation (UAC), located in Dumbravita, Romania excels in producing hard alloy aluminium parts specialized for the aerospace industry and looks forward to implementing more automation. The subsidiary in Romania of the American company was established in 2010 as the first hard alloy aerospace extrusion production site to be located in an Eastern European EU country. UAC is a Tier 1 supplier of the aerospace industry, delivering products used mostly in the fuselage and wing sections of aircrafts, such as seat tracks, wing stringers, wing ribs, crossbeams, cleats, hinges and many more. Passengers on the Airbus or Boeing aircrafts will definitely encounter the company’s products, but they can also be found on helicopters, jet fighters and smaller planes, such as the Fokker or Pilatus aircrafts. The company’s major competitive advantage is the synergies derived from the collocation of the most important manufacturing processes; billet casting, extrusion, machining, surface treatment, and assembly, supplemented by the exceptional know-how accumulated over a 100 hundred years of business practice at every production stage. In addition to the “one stop shop” value proposition which grants customers the opportunity to purchase “ready-to-fly” solutions, the company manages to maintain the desired high quality standards while also having the shortest delivery times in the market, thanks to its streamlined processes. and other automated solutions, which are supervised by a human workforce. In two applications which are critical for achieving high quality results, the tasks are conducted by FANUC automation products. Easy programing makes it possible to quickly change between tasks. One task is precision cutting of dies used in extrusion presses, and the other is loading high temperature aluminium billets into press machines. For the first application, the company uses the FANUC ROBOCUT die cutting machine to ensure excellent surface quality and shape of the dies, which in some cases need to endure pressures of up to 16,200 tons and high temperatures in the extrusion presses. In this industry, accuracy is a must when creating a die, because even the smallest error when gone unnoticed, can cause a significant amount of products to become defected, therefore the 0,001mm precision that is offered by ROBOCUT is highly valued in this process. The die cutting machine is running 24/7 since its installation four years ago, in three shifts, producing approximately 9-10 dies a day. Given the flexibility of the ROBOCUT and the easy programming platform offered by the FANUC CNC control, UAC can manufacture hundreds of different types of dies for its production purposes, acquiring the agility to stay competitive in the market. “We only stop the machines to perform maintenance tasks signalled occasionally by the machine, for example changing filters or checking the ionization. For other preventative maintenance tasks we ask FANUC for assistance” – says Catalin Ghiugan, Die Design & Manufacturing Manager, UAC. The other application illustrates advancements towards automated production solutions. As the company uses heavy raw materials in the form of 20 to 120 kg aluminium billets, moving, handling and loading of the materials become increasingly difficult. “In the past the extrusion press machines were loaded with billets by using a conveyor, but this method created unwanted scratches on the surface of the billet and generated dead time for the press, therefore we replaced the conveyor with a robot to handle this task. We started with one robot loading one press machine, but after getting good results for this process, we applied this method to all of them.” – says us Andrei Pop, Maintenance Manager. “After upgrading to the first stage of automated processes we anticipate more automated solutions to come, and will optimize production in different stages”. Satisfied customers are really conscious about the continuous improvement of facilities which constantly deliver on their promises. As a result, it is not surprising that in 2015, Universal Alloy Corporation earned the “Supplier of the Year Award” from Boeing, and the “Best Performer Award” from Airbus. As Michael Tojner, founder, and Chip Poth, CEO, puts it: “We will continue to invest in innovation to maintain and increase the quality and reliability of our products and services. We have successfully grown from a US-based extrusion company to a global aerospace components company, and our team is proud of the success over the past 20 years. We believe that the next 20 years will be even more successful – the best is yet to come!”.